The original Pensacola Bay Bridge opened in 1931 as a narrow, two-lane bascule (drawbridge) structure. Prior to this time, travel between the peninsula and mainland was possible only by boat. 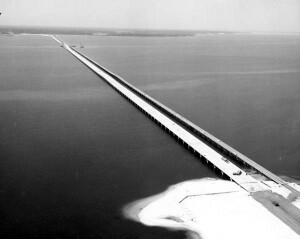 Built at a reported cost of $2.5 million, the initial Pensacola Bay Bridge charged users a $5 monthly toll. Seventeen years later, the bridge was re-named in honor of influential local businessman Thomas A. Johnson. 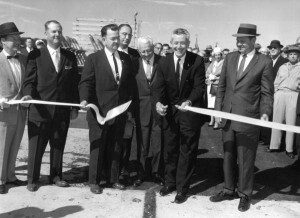 Johnson had served as the Secretary of Florida’s State Road Department, the predecessor to today’s Florida Department of Transportation, and was credited with removing the toll from the bridge. 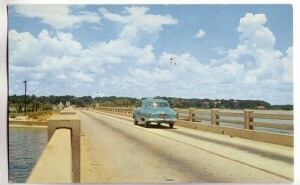 The Thomas A. Johnson Bridge served the traffic needs of the growing community throughout the 1950s. On October 31,1960, Florida Governor Leroy Collins cut the ribbon for the current Pensacola Bay Bridge. It was a four -lane structure named in honor of Florida State Senator Phillip D. Beall. The bridge was widened in 1987 to add shoulders. Construction on the third Pensacola Bay Bridge will begin in spring 2017. This bridge will accommodate a total of six travel lanes, adjacent 10-foot shoulders, and 10-foot shared-use paths for bicyclists and pedestrians. Completion of the new bridge is currently scheduled for mid-2021.